The drink of choice among the wealthy is wine brought from Italy or the region of Massalia. It is normally drunk unmixed with water, although sometimes water is added. There are a number of similar references in Classical sources to the Celts’ fondness for wine. Most references emphasize that the wine was unwatered, and that drunkenness was common. Drunkenness is one of the most common slurs cast at any “barbarians, yet there does seem to be some corroborating evidence regarding Celtic fondness for wine. There are the many amphorae found pretty much everywhere the Celts were found, including Britain. And now, thanks to Luca Sormani, from Como, and Fulvio Pescarolo, from Robbio near Milan, both part of Italy’s northern region, you can buy a replica clay wine flask containing 80 centilitres of Uinom Laevum made with ancient recipes from grapes grown on a farm using ancient Celtic agricultural methods, and ancient Celtic for 140-160 euros ($170-$195). You can read Reuters’ take on the story here. The Celts in question are the Insubri, the Boii and the Senoni, who migrated to the northerm Italian area known as Liguria (as in the Continental Celtic langauge Ligurian) during Rome’s Tarquin era, around 500 B. C. E. The region is the same area where the real Lambrusco is made. The techniques used to make the wine are based on the “Arbustum Gallicum” described by Roman historian Columella, in De Re Rustica . The soil, deposited by river, is sandy, and swampy, creating very specific growing conditions. There’s a reasonable description of the horticultural methods, in particular the way the vines are deliberately kept low, and the use of wooden casks (a Celtic innovation) here, in Italian. The Guardian reported that builders, accompanied by guardian archaeologists, removed part of the floor in the nave of Lichfield Cathedral and discovered an exquisitely carved limestone angel. The angel was found in three pieces, and is missing part of his robe. Gabriel (I suspect because he seems to be carrying a staff, a mark of the messenger, one of Gabriel’s functions), is the left panel of an Annunciation scene, but no other sculptures have been found. I’m particularly delighted by this discovery because while I “knew” that medieval sculptures of this sort were usually painted, it’s quite lovely to actually be able to see the colors. Update 2/27/2006: Even the Parthenon was painted, so why not an angel from the the tomb of St. Chad? Last week both Mirabillis.ca and Celtica Studica linked to stories about an incredible find of five Celtic battle trumpets, or carnyxes (singular carnyx). The 470 objects and fragments of objects, (the find is stupendous in terms of the objects) were found at the end of September during a dig at Naves, in Correze in southern France, in a ditch hollowed out of a Gallic-Roman temple. Their find doubles the number carnyxes (or really, pieces of individual carnyxes) we have. Four of the carnyxes end in boar’s head bells, the fifth, a snake. You can read about the find yourself here; it’s a remarkable collection, which would be notable for the other artifacts even without the carnyxes. This article has a picture. Head of the Deskford carnyx. This isn’t the only time carnyxes have been found. Sometime around 1816, in a field in Deskford, near Leitchiston, in Banffshire, Scotland, the remains of a carnyx were found, one of only 5 to be found Europe-wide, until now. Dating as far back as between 100 and 300 C. E., the fragment was the “head” or bell of the carnyx, featuring a wild boars’ head (see the image on the left), was made of beaten bronze sheets and brass findings. At Deskford, in north-east Scotland, the finest example of the surviving carnyx parts was found, amongst other offerings, in a peat bog. ( Hist. 29.5-9; Cited in Cunliffe, Barry. The Ancient Celts . Oxford: Oxford University Press, 1997. 103). 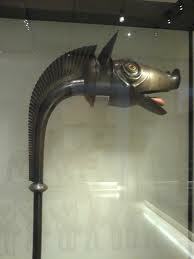 The carnyx is frequently featured on ancient Celtic coins, on Roman sculpture, even on sculpture in India. 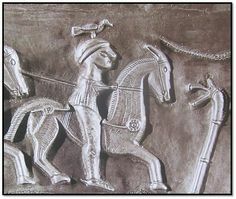 Perhaps the best known example of the Celtic war trumpet in art is on one of the interior panels of the Gundestrup Cauldron (see image to your right). In the late 1990s John Kenny reconstructed a playable carnyx based on the fragments found in Deskford. He subsequently recorded several CDs featuring the carnyx, even working with performers like Kathryn Tickell, who features the ancient horn on her album Ensemble Mystical , on the “Burning Babe” track. You can hear a bit of John Kenny playing one here, or on his Voice of the Carnyx album here. Since I’ve been horribly derelict in posting about Joseph Eska’s article regarding Indo-European, Celtic languages, family trees and cladistics, I’m going to simply point to the very helpful post from Angelo Mercado of Sauvage Noble. Go read it. I’ve posted about the heart breaking destruction, damage, and looting of Iraq’s archaeological treasures, and cultural history before, here and here. The looting and destruction has worsened under the Coalition. This article in The Guardian from Zainab Bahrani, a University of Columbia archaeologist describes the current situation. Don’t miss the links at the bottom of the article, and you might also take a look at Dr. Francis Deblauwe‘s chronicle of the damage done to date. The Snettisham Torc is probably one of the most famous British Celtic artifacts, with good reason. It’s gorgeous, and exceedingly well made. A fair number of torcs have been discovered as parts of hoards in Britain, many of them in the Iceni territory around Norfolk. The so-called Sedgeford Torc was discovered in 1965. Recently archaeologists in Sedgeford, Norfolk, near the site of the original find the torc was part of, found what appears to be the missing terminus link of the torc. You’ll no doubt notice that despite the damage, the quality and style of the Sedgeford torc is strikingly similar to that of the Snettisham torcs, suggesting that they might have been made by the same artisan or group of artisans.